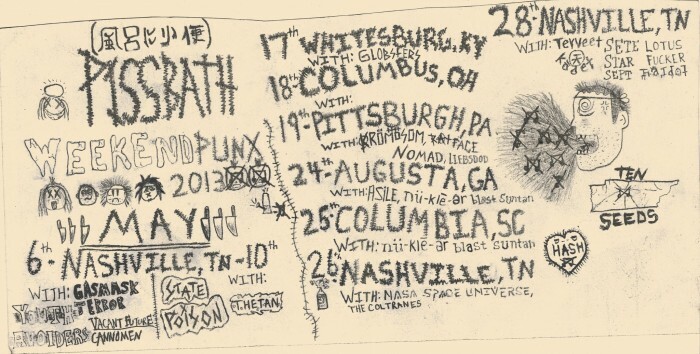 Middle Tennessee’s stoopidest punk band are gonna be doing couple of short dates above and below the Mason-Dixon line mid May, and everywhere west of the Mississippi in June and July. If you’re lucky, they’ll be playing your town. Everybody who’s anybody thats been paying attention to the internets lately knows Pissbath put out one of the top punk demo tapes so far this year, clocking in at 7 songs in 8 minutes, and you’d be a dingus to miss out. They still need a little help with the June and July dates, so if you wanna help a punker out email Conner at primitiveprison@gmail.com. The dates for May are the top image, and click below for June and July.